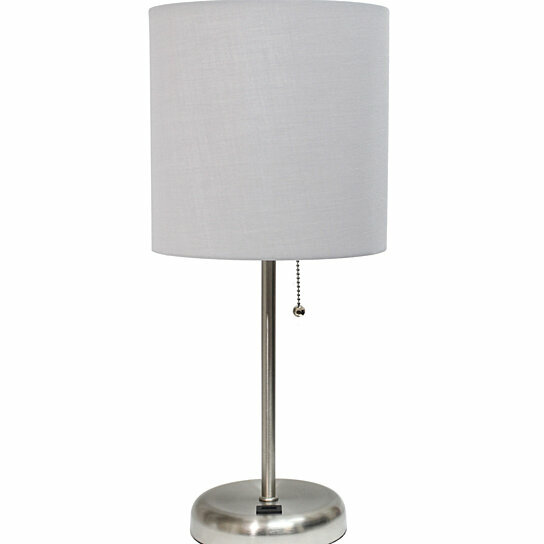 This fun and fashionable lamp features a brushed steel base and a fabric shade. It comes equipped with a USB seated in the base for use to charge mobile phones, handheld games, tablets, and other small electronics. This lamp will add a fabulous flair to any room. Perfect for bedrooms, kids and teens, college dorms, nurseries, or fun offices. Material Breakdown: Fabric 25% iron 69%,plastic 6%. Shade Security: Socket Nut. Maximum: 60 wattage. Bulb Included: No. Switch Type: Pull switch. Bulb Type: Incandescent (A-19). E26 Medium Base. Switch Location: Socket. Brushed Steel base with USB charging port on base. Perfect for bedrooms, kids room, college dorm, nursery, or fun office. Material: Metal. Weight: 3.08 lbs. Dimensions: 8.50"L x 8.50"W x 19.50"H, Shade Diameter: 8.5" x Height: 19.5"
Finish/Color: Brushed Steel/Gray. Features a USB Port on base for charging your phone or other device. Uses 1 x 60W type A medium base bulb (not included). Height from Base to Socket/Shade: 11"